The DVM 90XL is an enclosed microwave stabilization platform designed for configurations featuring up to 3FT antennas. Ideal for heavy-duty deployments operating offshore, or in high wind environments, the DVM 90XL represents a flexible solution for operators looking for reliable Line-of-Sight (LoS) communications in a protected enclosure. The DVM 90XL System is a ruggedized, automated tracking and stabilization platform. 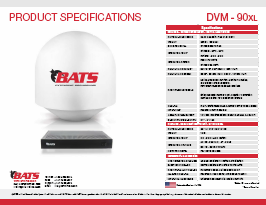 Positioned for dual ODU applications and antennas up to 3FT, the DVM 90XL provides BATS’ tested medium payload, heavy duty platform for organizations in need of a fixed, nomadic, or fully mobile broadband communication link.